When Arkady Petrovich comes home from college, his father finds his eager, naive son changed almost beyond recognition, for the impressionable Arkady has fallen under the powerful influence of the friend he has brought with him. 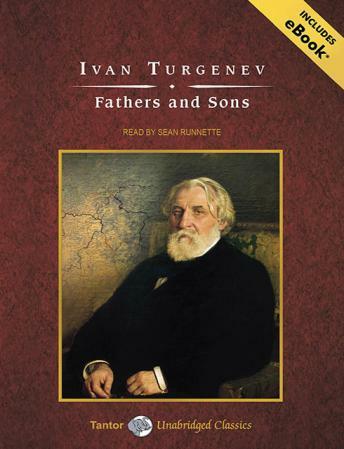 A self-proclaimed nihilist, the ardent young Bazarov shocks Arkady's father by criticizing the landowning way of life and by his outspoken determination to sweep away traditional values of contemporary Russian society. The narrator is a champion at using distinctive voices without any help from dialect or accents. Bazarov's is unforgettable, and the performance brings out for me as reading the book never has the qualities and even lovableness of the hero---never mind that he supposedly rejects contemporary aesthetics and conventions; mostly, he wishes to shock, and he does. That' a familiar phenomenon. He's so young, and his death is a terrible waste.